In J.K. Rowling’s early Harry Potter novels, Severus Snape is bit enigmatic, but mostly just an antagonistic prig who seems to have it out for Harry for no real reason. As the series continued and concluded, though, it’s not just Harry’s story that is expounded upon but also that of the much-maligned Snape. Readers learned that the perpetually greasy wizard may have actually been the ultimate hero of the series (well, it’s between him, Harry, and Neville anyway), as he was willing to trade everything because of his unrequited love. A character that was always wavering between good and evil suddenly came into focus as a tragic figure who never fit in, but was still willing to fight for the people he loved—even if they never loved him back or even knew of the sacrifices he had made for them. Rickman saw the enormous emotional potential in a character that could have been reduced to a thorn in Harry’s side. And with that information, along with his own incredible gifts as an actor, Rickman always lent Severus more pathos and humanity without sacrificing any of the early menace he possessed when first introduced. He always played interesting characters, and with Snape he found a more nuanced character than appears in plenty of literature. A video by YouTube user kcawesome13 (a.k.a. Casey Linenberg) has streamlined the story using the films to show every Snape scene now in chronological order. Combing through the later films to fill in the early days of Snape’s life, Linenberg is able to show the progression of a gawky teenager that doesn’t fit in and is teased by a man the rest of the world reveres. 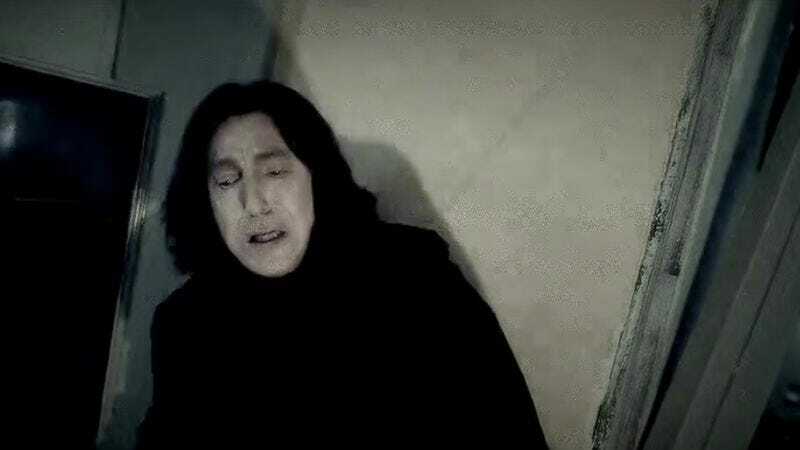 His love for Lily (Harry’s mother) and his hatred of James (Harry’s father) results in the complicated feelings toward Harry, and this chronological edit clearly shows who Snape really is: a good man who seemingly only knew disappointment and anguish. A testament to the brilliant characterization of both Rowling and Rickman, this video—especially in light of Rickman’s passing this week—reveals a complex and dark character hidden among flights of fancy that is more recognizably human than he had any right to be.